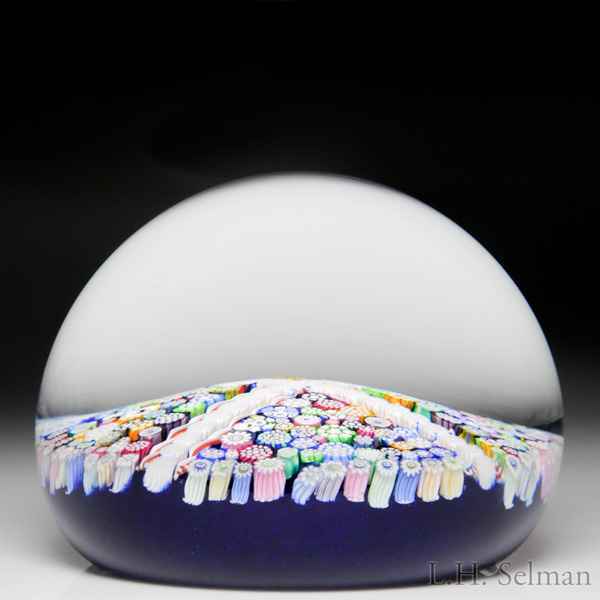 John Deacons 2014 close packed millefiori cross paperweight. Four triangular panels of colorful and varied millefiori canes, including stardust canes, thistle canes, silhouette canes of a deer, rooster and a bird, Clichy-type rose canes and others, are defined by two intersecting rows of white stardust canes bordered on each side by red and white twist segments, with a white star cluster cane at the nexus, over a translucent cobalt blue ground. Signature/date cane. Diameter 3 5/8".